I am researching the use of emblems on early American motor vehicles and I am seeking help to identify the dates of use of some unusual Briscoe emblems. I attach photos of two dog bone-shaped Briscoe emblems. They are both original emblems and one is part of an emblem collection known to have been put together in the 1930's and maybe earlier. These Briscoe radiator emblems are identical in shape and size to several emblems made for the Chandler motor car and I attach a photo of a Chandler emblem from 1922 for comparison. There are very many different Chandler emblems of this shape. Chandler cars were made betwen 1914 and 1927. Briscoe cars were made between 1914 and 1921 but I can find no evidence of any link between Chandler and Briscoe. 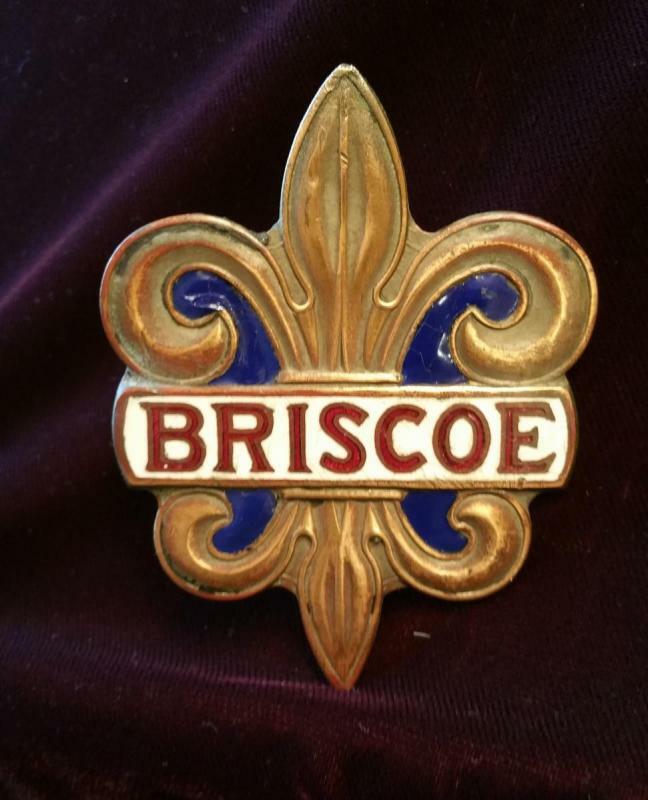 If you have an information that would help to put dates of use on the two Briscoe emblems, I would be most grateful. Interesting. Although there are differences in the sides on these, the similarity is remarkable. Perhaps somebody copied somebody else? Attached is what I've always felt was the more interesting Briscoe emblem but await your future post so I can date this one. 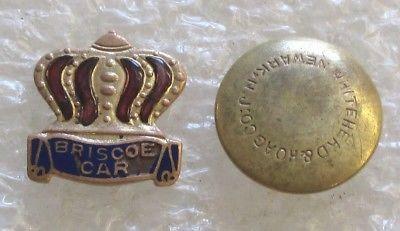 I have also attached photos of a Briscoe advertising letter opener, a salesman's lapel pin and a stickpin using the crown type emblem. In the photo with the stickpins in the old car pincushion, it's the pin on the far right. I've collected these for a long time and have an interesting assortment. Some of them are tiny versions of the radiator emblems but knowing what year they were used would be great. I like your pins. Great collection! 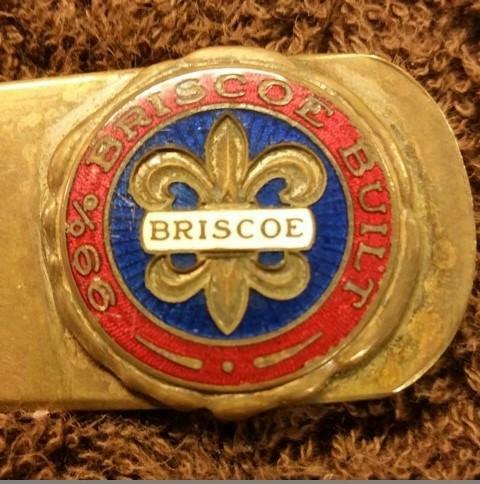 Your Briscoe emblem appeared about 1917 and may have continued to 1921 but I am still looking for confirmation of these dates. Regarding the dog bone-shaped Briscoe emblems shown earlier, my Chandler example was not a good one, because, as you noticed, the ends are curved. Anyway, here are two more Chandler radiator emblems, which much better show the similarity with the Briscoe emblems. If anyone can help to give the dates of use of the Briscoe dog bone-shaped emblems, I would be most grateful. I think you are on the right track, some relationship here. The AQ "The American Car since 1775'" shows no ownership relationship between the 2 makes, but who knows for sure. A few thoughts. With the Briscoe (Jackson, Michigan) and Chandler (Cleveland, Ohio) plants being about 190 miles apart, it is not inconceivable that employees/owners were aware of each other's work and influenced even subliminally by each other's details. 2nd, since emblems were usuallly made by specialty shops (more jewellery than anything else), do you have info on back identifying such companies? Could both have been made by same emblem shop? 3rdly, some early Briscoes (1914 era) were "one-eyed" monsters, with a single headlight molded into top of radiator shell, leaving no place for a traditional ornament/emblem. Some photos of those show some sort of horizontal plate/badge on lower edge of rad shell. Other photos show a large brass script Briscoe surface mounted to radiator front. Some show no badging on front at all. It may be that the dog-bone emblem was mounted on side or rear of car. The later Briscoes as mentioned above wore the more tradionally shaped Fleur-de-Lys style badge. Finally, from a good advertizing perspective, a horizontal plain badge like this clearly tells the passerby what the car is. Many badges of the era had such tiny writing that one could only identify them by a unique badge design, like the Fleur-de-Lys. 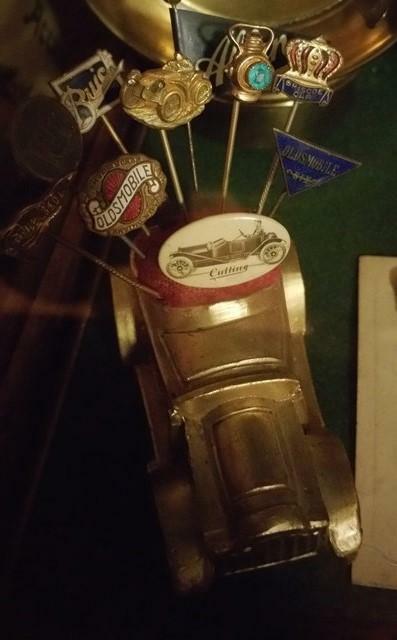 This pic shows the original emblem (and fasteners) from my 1931 Chrysler CD8 Roadster (large 8 cylinder car), and is a great example of minimilist advertising, the badge is about 1" diameter and the Chrysler writing is virtually illegible form 3 ft away. Only identification on front of car!